Are Americans waking up to how constantly the media lies? For years, conservatives have angrily observed the tendency of the MSM (MainStream Media – newsmagazines, newspapers, TV networks, and just about all other news sources here in the United States with the possible exception of Fox News and a few stalwart conservative websites and magazines) to gang-publish provable lies as "breaking news." News sources which historically had a proud heritage of publishing only truth have become figurative wastepaper (including electronic media) the instant they were published – the New York Times opinion page, for instance. The absurd subject of Global Cooling/Global Warming/Climate Change, etc., is merely one tiny aspect of the lies that assail us every day. Today, we are broadening our focus to include other topics and other sources. The President has complained mightily for months about the situation; CNN is a particular bugaboo of his. The June 22, 2018 news day was no better or worse than other days have been in the past two years or so, and the coverage of topics seemed about typical for a Friday. During this writer’s usual perusal of various news sources, we were struck by the level of the fakery that MSM sources have attained. These stories were chosen, not because of any commonality of subject, but a commonality of attitude that they reveal: the superiority and arrogance of the leftists who produce the false stories these articles reveal. This is who the Left have become. Their idea of trouncing the right really bad is to win the argument by appeasing their own following. They will do this by publishing ‘talking points’ that the lefty mob can hurl at the dullards on the right, and reciting the same script on all news sources. A unified front fills their needs nicely. This is not a mistake to be fixed by a "correction": Time created this propaganda lie on purpose with malice aforethought. And they continued their unrepentant tactics even after they were confronted with the facts. 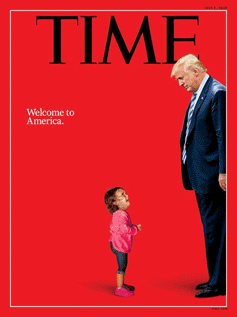 The crusade continues even as Time's fortunes decline; it is amazing that Time has not realized that there are a few mainstream magazines who have survived during the era of Trump, but they are the ones who are scrupulously bound to the truth. Magazines like Time and newspapers like the New York Times are hemorrhaging money and have lost the appeal that they once had. GMO: The man who had been waging war against Genetically Modified Organisms (GMO) wrote his story in the Wall Street Journal. Before 1996, GMOs were launched into the open market for foodstuffs of all kinds. The left got some idea that these GMOs were automatically bad for people and began demonstrating against them almost as soon as they were introduced to the marketplace. The food itself was vilified mercilessly; the offending grocery stores marketing the products became the scene of sign-carrying, screaming protesters blocking access from outside. Grocery store chains who received public denouncements were shown on national news shows and portrayed as purveyors of death-dealing merchandise. It still goes on: last night Fox News, of all sources, ran a commercial ad about the evils of GMOs in the mix with the normal advertisers hawking their wares of geriatric medications and pickup trucks. If we had not been writing this article, the GMO ad would probably have slipped by unnoticed. Monsanto Corporation was identified as the bad guy, pilloried for marketing their products in Third World countries which need the characteristics of GMOs to resist insects, blight, and diseases prevalent in certain species. The onslaught by ‘know-nothing’ protesters has been largely effective. There is no telling how many people – the Left’s precious children and others – starved because they were forced to rely on crops with low yields or with diseased fruit that could have been prevented using the GMO plants. Kids as Pawns: Rich Lowry’s article in the National Review, May 28, 2018 is an explanation of the misconceptions and misrepresentations surrounding the whole notion of bringing children into the fight over illegal aliens. The article begins with the statement, “As usual, the outrage obscures more than it illuminates…,” a familiar tactic of the Left. Predictably, children are held up as the victims of the efforts to uphold the law. The image promoted is that of a small child – big-eyed, sad, filthy in a cute way, very skinny, preferably a shirtless dirty-haired little girl – peering beseechingly at the camera, about to cry. We have all seen this kid, whether in Vietnam, Nazi Germany, or closer to home - though, strangely, never in Communist Russia or modern socialist Venezuela. That’s what it’s all about: establish a rallying point within the United States so that the whole clan can import itself. No one says that, but that is the purpose. These people have insidious ways of misusing our laws, bending their purpose in ways that our lawmakers never intended. Global Warming: And then the grand finale – an erstwhile global-warmist 'fesses up to his tactics as a recruit early in the fight against whatever the Left designated as the shadowy cause of the earth turning into a vast desert. The article mentions thirty years, but that would mean only beginning in 1988. Really, lying about the future climate began long before that, trumped up from the 1940s, when it began as global cooling, and carried through until recently. Where Al Gore gets his apocalpytic ideas. The Left has the temerity to lump it all together under the rubric of Climate Change. Of course the climate is changing. It always has changed, it always will change. And no one on God’s green earth has the capability to make it stop changing no matter how much tax money we waste on green mandates. There is one constant: change. We know that, but from the mid-20th century until the 21st-century was a decade old, people used fright tactics based on the supposition of Liberty’s arm sticking out of the global-warming-deepened mouth of the Hudson River. 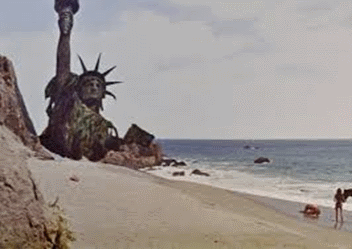 Al Gore tries to claim credit for that lie, but nearly the same image was featured in the movie “Planet of the Apes” from 1968. A far-seeing guy, that Al Gore! Yet despite its transparent falsity and failure to meet any of its own predictions, the global warming myth refuses to pack its little tent and go away. The fact that the catchphrase became ‘climate change’ tells all. Climate freaks cannot rely on the earth to conform to their theories anymore; they just have to come up with something else to keep the tax money flowing in. We are tired of the constant harping upon Global Warming this and Climate Change that. There are legitimate concerns about pollution, but the panic and propaganda have driven out any sense of proportion or sanity. The proper venue for that discussion is not in the hysterical MSM, but in serious academic and professional venues where scientific data can reign supreme – without the uninformed hype. There is little enough agreement or proof of any of the extant theories that lively discussion will continue if it's allowed. Just possibly, the furor and gullibility of those who do not pay attention is finally beginning to subside. For years the argument has raged focused upon minutia of opinion while the larger trend – the direction of science – remains unsettled. Though there is no consensus in the argument, the hype and nonsense seems to have settled down to a dull and ignorable roar. No doubt, all four of these topics will probably return for further comment and mis-statement - that’s just the way the MSM works these days. They make the same point in 16 different ways, trying to get one that sticks, and if the first 16 ways don’t work, 16 more will be tried. For now, they can use the fact that there are so many outlets to spew their mis-reportage, in coordinated league with one another. We are greatly outnumbered - but that may not be true forever. The spirit of our heritage is strong, and we won’t quit. Thomas Anderson is a multi-state registered architect and an ex-Air Force electronic technician, who is a keen observer of the human condition. Read other Scragged.com articles by Thomas Anderson or other articles on Partisanship. “It is the duty of a newspaper to comfort the afflicted and afflict the comfortable". Sounds clever. But therein lie two fatal errors. What are they? 1. There’s an unbearable arrogance in their mantra: who exactly left them in charge of judging who is “comfortable" and in need of being “afflicted”? And 2, who exempted journalists from their own judgement- of being comfortable and in need of being afflicted? On the last subject: there's a lot of money to be made in Climate Change. When the only consequence, for knowingly believing lies, is receiving the heartfelt approval of your peers.....why wouldn't you? what was depended upon as "factual truthful honest unbiased non-political not personal but only actual happening circumstances events occurences & more. Like Nazi Germany's National News\Media Propaganda Machine of the Third Reight, probably 98% of the "Political Propaganda Prostitutes" that pose as genuine authentic legitimate honorable American have simply "taken up where Nazi Germany's Fuhrer's Fan Club had left off. So Keep on Keeping on U guys totally ROCK & we & our great free nation's very ability to continue to exist [without the enivitability of a major terribly bloody revolution should we be forced to exercise what is every genuine loyal legal patriotic American's Duty Obligation & Right to defend... depends on U..